Regardless of how many times they had seen him, the audience was held rapt by the passion and the sanctity of the guitar-playing that filled the library, and they could agree that this was a young performer whose career who was worth watching. Later, during a conversation with Sherwin, it became apparent music is a form of time travel for him and for the audience. Delving into the world of the composer and allowing their music to flow into the present via his fingers, Sherwin is a guitar soloist and a leader of orchestral and choral ensembles. He has performed at the Metropolitan Museum of Art in New York; the Music Without Borders Festival in Montreal, Canada, and the Great Music Series in San Diego. 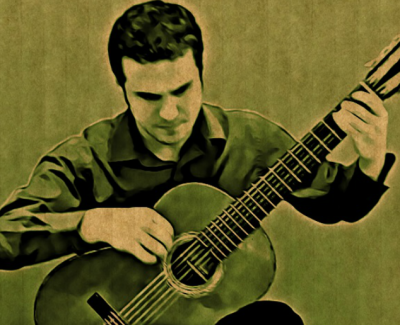 He practices three hours a day with his two main guitars: a classical guitar (made by Aaron Green, 2013) and a baroque guitar (made by Michael Schreiner, 2017, modeled after the French Jean-Baptiste Voboam instrument from 1690). Sherwin is an associate artistic director and conductor of the period-instrument ensemble, the American Baroque Orchestra. While at Yale, he was conductor of the ensemble, the Academy Sinfonietta, with players from Yale Philharmonia and Yale Symphony Orchestra, performing works by Bartók, Fauré, Barber, and Bordin, to name a few. This and other community music performances led Sherwin to be cited in 2016 by the town of North Haven for excellence in contributing to the musical arts. Sherwin hails from Roslyn, Long Island, N.Y. He was introduced to the guitar at 7 and began classic guitar lessons at 8. He started his formal musical training at Julliard College when he was 12. Sherwin composes his own music as well. He wrote for guitar for North Haven’s Veterans Day commemoration a song called “Colonial Echoes.” He said, “The title was inspired by melodies of Colonial America and the history of the country.” For the past six months he has been working on an untitled short sonata for guitar, for which he recently performed a draft for friends.